Happy New Years Eve! It's time for another Bloggers Challenge, this weeks theme is Reuse/Recycle. Or as I like to call it, clean out that alterable stash! I'm repurposing a Paper Mache Box I've had in my "collection". 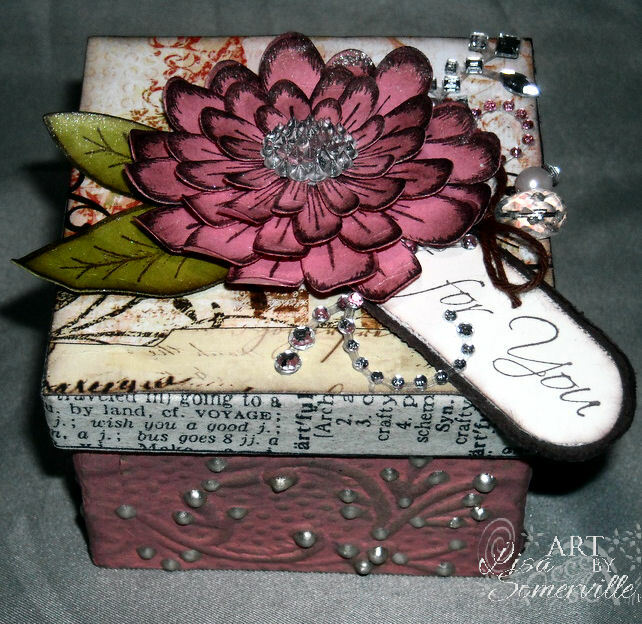 To give the Paper Mache Box new life, I painted the bottom with a Ranger Paint Dabber in Rose, then added some Pumice Stone ink on the embossed section and some Liquid Pearls. The top is covered in a piece of Prima paper, the edges with some Tissue Tape that was sponged with Pumice Ink. The Beautiful Flower is created with Heartfelt Creations Daisy Patch Flowers set, Daisy Patch Die, Elegant Single Leaves and Perfect Petals Die. The sentiment is from the Classic Message set. 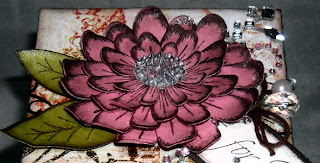 I added some Prima Flourishes, stickpins and Brown string to decorate the area around the flower. 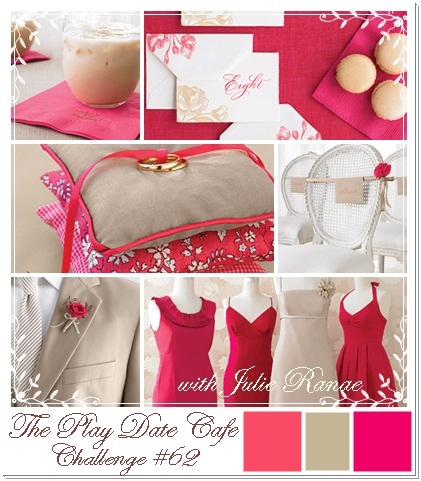 Looking for more inspiration using this weeks Bloggers Challenge theme, click on the logo on my sidebar to see what the other players created this week. Wishing you all a very Happy New Year! I'll be back later this afternoon to share the link to the NEW Kitchen Sink Stamps Forum and Gallery, some of the KSS Crew will be in the forums from Noon to Midnight EST, there will be plenty of fun Challenges, Games, Prizes, and Giveaways - be sure to join us! So Gorgeous, Lisa. What a fabulous recycle project. Beautiful! Happy New Year! Hugs, Gayle. Gorgeous! Love that flower and the richness in color. Beautiful gift box. Wow, it's a tresure in itself, don't even have to put anything inside! Lovely Lisa - great colors! Happy New Year! May 2011 bring lots of love, joy, peace and happiness to you and yours. This turned out beautiful, Lisa! The flower is great and all the little jewels and rhinestones just make it so delicate and pretty. What a lovely gift box Lisa. Beautiful colors! It's so lovely spending the end of the year with you in 'the cafe'! And I just LoVe this box, especially the newsprint on the side contrasting with the pinks - fabulous! Thanks for playing along with us at the play date cafe...Happy New Year! Absolutely gorgeous. Fantastic alteration of a plain old box. As I once was a decorative painter, I have a nice little stash of goodies! Maybe I should start altering them. Your box is gorgeous and I love the flower! Have a wondeful New Year! Hugs! Loose interpretation or not, this is GORGEOUS! I'm with Sarah, it's so great to celebrate the challenge and the end of the year having you play with us! How awesome is this!!!!! Happy 2011!!! I have often wondered what I could do with my paper mache collection. Now I know...this is truly stunning! I would consider the box a gift if it was given to me empty! Hope 2011 brings you lots of happiness! Oh my! This is beautiful...you definitely know how to reuse and recycle to come up with ART!! Happy New Year! Fancy schmancy box, very elegant! Happy New Year! I love what you did with the box. That lotus like flower on top is so beautiful. If you have a fav project of 2010, love for you to come by and it link up. What a beautiful red for that flower. Love it. Beautiful box, somebody is going to be a lucky recipient. Lisa, I'm a sucker for reusing/recycling myself! 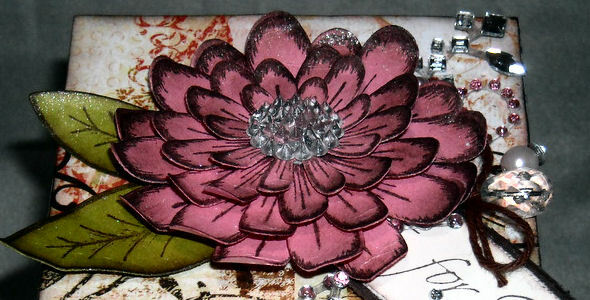 I just made a card on 12/31/10 using a chocolate bar wrapper (sounds hideous, but it was very pretty!). I like your ultra-feminine repurposed box...what a great gift it will make. Thanks for playing with us at The Cafe! This is GORGEOUS! Love it :-). Fantastic recycle project love the colors!! !